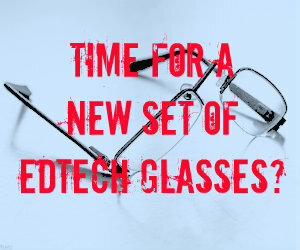 Time for a new set of EdTech glasses? This one’s been on my mind a while. Sometimes I wonder if we look at EdTech from a narrow perspective. The post below explains why. I’ve heard it a lot of times: “So what problem are you solving?” It’s a question I am often asked after presenting ClassWired. It’s not an imaginative question. I am expected to have a one sentence answer. The idea, frequently supported by leaders of the startup community, is that the problem-solution paradigm is the best way to view technology. It’s an idea implicit in (legitimate) questions being asked of EdTech too. Our own Scott Thornbury-inspired #AustELT chat shows just one example. Facebook: who even has 300 friends anyway? power windows: why do I need these in my car but not my house? How about you? How many other examples can you think of? Although we could argue the benefits and the negatives of each of these, they are all standard parts of our lives now. Without them we would have a problem to which they could be a solution. Closer to ELT home, I have a projector in my class. I’d never really needed one before. Good teaching doesn’t have a problem for which props are a solution, right? Yet since having one I regularly use it to do simple things like search Google images, or scan Wikipedia for key information that comes up in class. And, when I didn’t have one the other day, it was suddenly a lot harder to discuss the solar system. In the end we spent too long on those two words. All because we couldn’t simply show everyone a picture. What’s my point, you wonder? We can all be sceptical of EdTech. I am sceptical. My scepticism focuses mostly on the gap between possible benefit and actual benefit. Harvesting the possible benefit from technology is the hardest thing about it, especially within the dynamic of an education system. We can all be techno-utopian. It’s easy to theorise about the potential of learning networks and self-directed students on algorithmically-directed education journeys with teachers merely on the sidelines coaching as appropriate. Think about that the next time you don’t have to get up to change the TV channel. Featured Photo Credit: Tom Raftery via Compfight cc. Text added by eltjam. Good post! As with most things that change and especially with edtech, there’s a need for effective education and engagement with the reality that these are just tools and they are all around us now. Choose the best tool for the job or a tool that makes the job easier, quicker, or more engaging and effective. There’s still, in the sceptic camp at least, an energy sapping and contradictory combination of a deep lack of interest with a consumerist love of shiny things. When the shiny thing is the limit of the willingness to explore, we hit the wall. This is so true and I hadn’t even realised. Although innovation does happen when someone identifies a problem and comes up with a new solution, it comes up too when someone identifies something that isn’t a problem but is a gap. Or just random flights of fancy, which, as I also write non ELT stuff I know is at the heart of any good idea I ever come up with. Doesn’t the question “what problem are you solving?” tend to come from the tech-minded side of ed-tech? In today’s world, technology or new products can fill thousands of niches and needs. But education is a very special niche. Everything that is new in our field can and should be evaluated in terms of a single question “how does this improve or significantly add to learning?”. In fact, many problems that we can solve with technology are cool, pleasurable, and even ephemeral (BTW great list Lindsay). But educators are generally not attracted to these things. And I don’t think technologists will ever fully “live” in education until they first start asking how we as teachers want to improve education with our ideas/innovations. So, I agree. In general this is a bad question to ask educators. We would have a much better conversation if “they” asked a better question.